Hair cuts, hits, and day off! 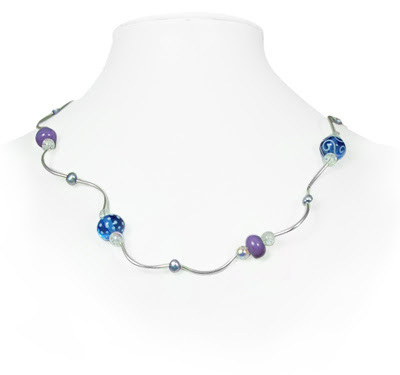 Here's a New addition to my website, Purple Odyssey necklace featuring lamp work beads by the super talented Laura Sparling. Just a quick update really! On Thursday I received a call offering me a position for a new job which I had applied for. It is a new career path for me, away from retail and I'm very excited about it. I shall be working for a company who supply whole sale Bridal accessories, jewellery, bags etc and I shall be their accounts administrator. I start on the 8th of August and I'm really looking forward to it! I get two weeks off at Christmas for starters!!! something which hasn't happened for about 8 years now! Horray! I love this, Janine. Such a simple but dramatic design! Thanks Laura! x Always best to please the bead artist! !